I understand where you are coming from – it is hard to find the time and the place to pray without being continually disrupted by little ones, your post could have been my post – it sounds so similar. I take time at night before bed to read my devotions and pray. This works for me now in my life – although I would love to start the day in this fashion as well. It's so good to hear someone else with as much distress over this as me. I physically or mentally cannot get myself out of bed with time to spare in the mornings no matter how much I would like to start my day in prayer, but at bedtime, after I've run myself ragged all day, it's nice to unwind with God. I can totally relate to this but I've moved to a different stage of life where I have a bit more peace. You do eventually get there but then you miss all of the chaos. I'm so happy to have 2 grandkids now where I get to enjoy the fun and noise of kids but then I don't have to worry about them standing at the shower door in the morning. When my 3 1/2 year old grandson and his 18 month old sister come over they follow me everywhere and want my undivided attention. When they are here I get NOTHING done as far as sewing goes but I do have a blast sitting on the floor reading, building lego castles, watching videoa and drawing. I don't know that I have any good advice other than enjoy the journey. When you get to my stage of life you will have many many memories like this one. I know HF has great understanding, love, and compassion for our sacrifices. I think my biggest prayer is for the strength and courage to be the best mom I can and to have patience in my trials. There just isn't enough time in the day to get it all done and sometimes I get frustrated but strive for balance too. The two words that I learned when my oldest daughter got married in December around Christmas that have helped me in my life is “Oh, Well. . .” It helps me keep the important things in perspective. It's much like one of the GA's said that we need to not be caught up in “Thick of thin things” that has also helped me decide discern when I'm getting upset about my creative work. Does that make sense? Hope it helps a bit. Sorry, this is so lengthy, but I also want to say that I admire you for your commitment to your husband, children, and family. They are definitely our greatest treasures!!! I just found your blog. Lovely. unfortunately if you get up at 3 in the morning, then it isn't restful, is it? But I bet it is peaceful. I feel badly whenever I hear one of those talks that mention how they would see their mother kneeling. . . oh that is a song. 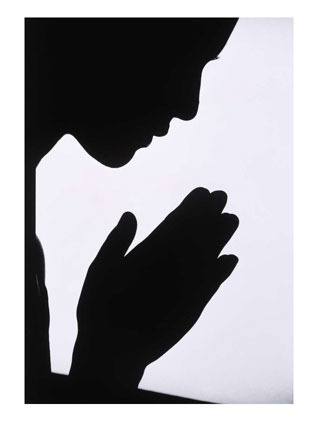 I don't ever think my children saw me kneeling in secret prayer. The only time they saw me kneeling is during family prayer. I guess I didn't set too great of an example. guilt, guilt, guilt. . . I pretty much had a prayer in my heart all day though. PS I loved everyone else's comments. What a sweet blog and funny name. I have very often found myself praying in the car. Not with my eyes closed that is for sure, but when the kids are quiet and you have a minute. I also this the song may not necessarily mean an hour all at once…. Maybe if you add all the times you pray in a day together, it would add up to an hour. Oh the memories…..How about little fingers poking under the door? Now just the dogs sit outside the bathroom door while I shower…..and yes they too sometimes fight! I was down to only one home….then I gained another back. That makes two home. I just hung up the phone and three has just asked to come home!!! Yikes! Even though they are all what the world calls “adult” in age. This means they will be fighting outside the bathroom door again! I am now going to go take my one and only time in my life that I have an hour that I can pray and ask for available housing to miraculously arrive for number three! Thanks for the words of the quote. Lovley. I have a hard time making my prayer meaningfull. I rush through it with on ear on things that happen outside. But I believe Heavenly Father knows your situation with all the kids and knows the intentions of your heart. This is so true! No peace for a Mother. And pray for an HOUR? Maybe a few snatched minutes yes. Mine are teenagers and they still bang on the bathroom door! I'm terrible about making time, but the one thing I TRY to remember to do is to say a prayer of “thank you” at least once every day. Since I'm great at praying for help in dire circumstances, it's only fair to give thanks other times, right? I hear you Dear Sister…I.Hear.You. Oh the guilt of saying I wish I had more time..so I could pray. It's hard. I call my time “talking” not praying because I do mine in the car. It's truly the only time I'm alone. The scary part is that I find myself in my work parking lot and wonder how I made it there. Did I stop at all the stop lights? Please say I didn't cut someone off. It's tough girl.. Just do your best..He loves you either way. that whole quiet time thing has never really worked out for me, but the continuous prayer thing has. pray all day. kind of a running monologue-to-God type thing–i'd say dialogue, but He's not answering me in an audible way, but i guess it's still a dialogue. hmmm.